Orto Botanico is a garden which was built in 1858. 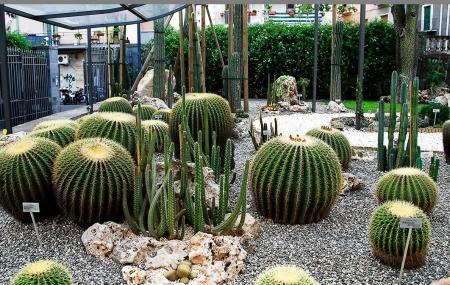 Stretched over an area of 16,000 sq m, it is owned by the University of Catania and is home to many exotic and unique plants and flowers. In 1865, it was increased in size to include the plantation of some exquisite Sicilian spices as well. It consists of two divisions, namely the Hortus Generalis and the Hortus Siculus. The garden also has greenhouses and tanks for aquatic plants. Guided tours are available on prior booking. Children and students have concession in entry fee. How popular is Orto Botanico? People normally club together Parco Archeologico Greco Romano Di Catania and Herborarium Museum while planning their visit to Orto Botanico. A very nice botanical garden. It is not very large, but it is free and they also offer you a map plan. Beautiful species of plants and very nice design. I really enjoyed my visit there. Have to say I really enjoyed this place and was pleasantly surprised. We had been to the one in Palermo the previous week which costs £6, is quite a lot bigger but also really run down and not well maintained. So I really expected nothing given this one is for free. It is quite compact but we still spent about an hour here. It's well looked after and has a green house and a really nice cacti garden. Definitely come by and check it out if you have some time. This is a beautiful Botanical Garden. It is well worth a visit. If you want some peace away from the hustle and bustle of the busy streets then this is a place for you. Take a slow walk round or take the load of your feet and have a sit down and take in the beauty of the gardens. Very beautifull and peacefull spot inside the city. An absolute must!!! Free entry, nice staff and an interesting collection of plants and herbs. All in all a calm place of inner peace. Grab a coffee and walk through this green paradise.